Our newest combo, introducing "Colors". Made of the best quality material in the industry, all the bells and whistles are included and a major pop to it's bounce! 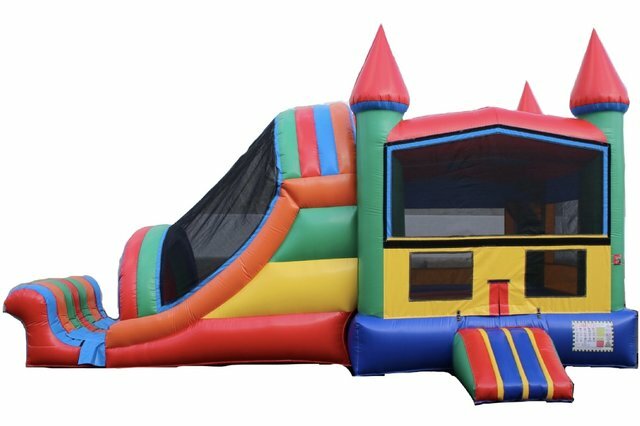 This combo bouncer includes a basketball hoop inside (ball not included), a climbing wall to an awesome slide into a end stopper for added safety! This unit can also be used as a water slide combo, please visit our water slide section! "Colors" is a bright and beautiful combo that is perfect for helping entertain any group of kids! Don't forget to add on our inflatable basketball challenge as well to help complete the party!